In his book The Community of the Beautiful the late Alenjandro Garcia-Rivera maps new ways of exploring the relationship between Beauty and Truth. As part of his exploration he frames an aesthetic that is rooted in a selective ‘foregrounding’ and a ‘lifting up’ of persons and things, derived from a ‘lifting up of the humble’ in Mary’s poem recorded in the early chapters of Luke’s gospel. In my opinion Claudia’s approach to art making can be understood within this aesthetic framework. Claudia’s art also further suggests a marriage between the modernist dream of ‘truth to materials’ and the meta-modernist aspiration towards a ‘new authenticity/sincerity.’ We see worlds forming new relationships. Claudia has exhibited her drawings, paintings and mixed media installations for quite a few years. Her individual museum and gallery shows, involvement in group shows, and several international residencies have not only opened doors to growing interest in her work, but also a growing number of critical and appreciative writings and reviews. I would like to add an `amen’ and a few comments of my own. I have been following Claudia’s work, sometimes closely, sometimes from a distance, since her undergraduate days in the late 1990s. I have talked with her about her work with patients and children in one of our local hospitals and also learned of her family and her Mexican-American heritage. I have watched how these different threads have been woven into the fabric of her artwork. In much of her work she portrays children. For Claudia the image of the child becomes a site where worlds collide. Her gracefully drawn, painted and sculpted children speak from a world in which they sometimes see themselves as heroes, avengers, all powerful, all wise. They often dress the part. Some wear a super hero costume, a wrestler’s outfit or a pink hooded sweatshirt. In other images we see them carrying guns and weapons for the battles they hope to fight or the vengeance they seek. In some of the works they are in physical conflict, pushing, striking out at each other. In others we see these children alone, fragile, vulnerable. They seem to be searching for something. They look lost. We look at these images from the vantage point of our grown up world. We ‘know’ about children. In our world images of children are placeholders for our own nostalgia for a lost innocence. Or children are exploited as cheap labor or they are romanticized/eroticized in everything from Victorian photographs to South East Asian brothels. However, Claudia’s artwork reminds us of how little, in fact, we really know. We lose sight of the fact that these children have dreams and visions of their own. Some of the dreams seem bright, others are dark and troubled. Nonetheless, Claudia’s images are eloquent in their understatement and their quiet reminder that she is primarily portraying people, not political statements or sermon notes. When we look at Claudia’s children, we are looking from a world in which we claim to understand their naivety, their vulnerability, the unreality of some of their self-concepts and ambitions. We flinch as we reflect on the images of their aspirations to power, their desire for revenge. Where could they have learned these values? What do we attribute the darkness and the jagged edges of their body language to? And what about the terrible consequences of some of the things these pictured children aspire to? We sense that these fragile, angry children have no idea of what they are digging themselves into. Our awareness and concern adds to our vision of their fragility and awkwardness. But here is where worlds collide again, in yet another way. In our world of polished digital perfection and seamless shifting surfaces, these artworks with their delicate lines, awkward fragile gestures, the rough finish and the carefully muted colors seem to whisper rather than scream for our attention. In our world of global social networking some of these children seem to be hungry and thirsty for another kind of connection. Claudia Alvarez: Falling Rope of Silence, 2011, installation. Claudia Alvarez: El Chupon 3, 2010, painted ceramic. 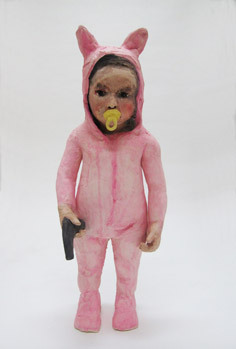 Claudia Alvarez: Volver, 2010, 30" x 11" x 14", painted ceramic. Claudia Alvarez studied art at the University of California-Davis and at the California School of Art in San Francisco, completing her MFA in 2003. She has exhibited throughout the US, Canada and Europe and has worked as an artist in residence in Mexico, Switzerland,France, and China. Her website is www.claudiaalvarez.org. Steve Scott (MA Global Leadership Fuller Seminary 2009) is the director of CANA (Christian Artist Networking Association). He is also an adjunct lecturer in the Creative Arts Department at WilliamJessupUniversity, Rocklin, California. His two books on art theory are Crying for a Vision and Like a House on Fire. His most recent album is Emotional Tourist: A Steve Scott Retrospective. See http://cana-arts.blogspot.nl and e-mail Steve at info.cana.arts@gmail.com.